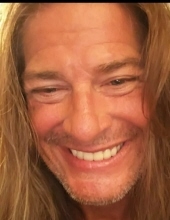 Vincent G. Pepe of Lavallette, NJ, 51, known to his friends as Vinny, passed away April 7, 2019 after a brief illness. Vinny grew up in the Beacon Hill section of Denville before moving to Rockaway and finally retiring to Lavallette, NJ. He worked his entire life in the family business, Farmer Electrical Supply in East Hanover NJ along side his father who is previously deceased. He leaves behind his loving mother, Glenda Pepe, of Lebanon, NJ, his adoring sister, Lisa Pepe Mroz, her husband Mark of Pittstown, NJ, a niece Alison Mroz and nephew/Godson Michael Mroz. He will be truly missed as he brought much joy into their lives. Vinny spent much of time enjoying outdoor sports. His favorites included golfing with friends and surf fishing. He loved hard rock music and could often be found playing his guitar REALLY LOUD. Although Vinny had no pets of his own, he spent time with Sammy, the dog of his friends, Shannon and Ralph. Sammy would visit Vinny often and the two of them would spend time on the beach or playing at the house. He enjoyed every moment he spent with her. Sammy brought much joy into his life. Vinny was blessed with many friends and spent lots of fun times with them. The stories he has shared! He had a heart of gold and was loved by many, and will be greatly missed by all. His sister Lisa and brother in law Mark will remember him as being a loving brother with a wild streak a mile long who knew how to have fun. His niece and nephew will remember his generous nature. Vinny always opened his home to them and they spent much of their summer break at the beach with him. Please remember him as who he was, a wonderful son, loving brother, and a great friend. "Email Address" would like to share the life celebration of Vincent G. Pepe. Click on the "link" to go to share a favorite memory or leave a condolence message for the family.